Fans of guitarist Pat Metheny will want to check out this soundtrack from the 1985 film The Falcon and the Snowman. It was Metheny's first film score and from what I can tell, this music doesn't appear on any of his other albums. Metheny was between record companies at the time. He left ECM and he would soon begin recording for Geffen Records. He made some changes to his band in the early 80s though Lyle Mays was still his right hand man. And he was starting to get into South American music which would become very prominent in his late 80s albums. Metheny was a guest soloist on Jerry Goldsmith's score for the 1983 film Under Fire which was nominated for an Oscar. So it's not surprising that Metheny would be hired to score a film. The Falcon and the Snowman starred Timothy Hutton and Sean Penn and it was directed by John Schlesinger. The studio was Orion who also produced Under Fire. So I assume an Orion exec suggested Metheny to Schlesinger. Metheny used his usual group with Lyle Mays on piano, Steve Rodby on bass and Paul Wertico on drums. Metheny uses his synclavier to alter his guitar sound. There is also an orchestra and a choir and vocals by Argentinian singer Pedro Aznar who was a member of Metheny's group in the late 80s. The kicker is that David Bowie contributes guest vocals on This Is Not America and that song was a top 40 pop hit. Bowie was on EMI at the time and that's why the soundtrack is on EMI. Metheny fans will want the soundtrack because none of this music appears on any of Metheny's other albums. It's the only time he recorded for EMI. You can get This Is Not America on Bowie's EMI comps. It's a little different than Metheny's usual music because it's a film score. His only other score was for the 1999 film Map Of The World. 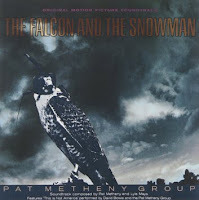 So the Falcon and the Snowman is a very unusual Pat Metheny album and his fans should check it out. Here's Pat Metheny Group performing Daulton Lee in France 1987.